Day 2 of the film making workshop by Tim Skousen followed the same pace as Day 1. We discussed text (plot/story) and sub-text (message/moral) and watched extracts of Peter Berg’s Hancock and Mike Nichol’s The Graduate as well as the complete movie The Nightcrawlers by Dan Gilroy. The latter is a very interesting critique of the media world and the society of spectacle. 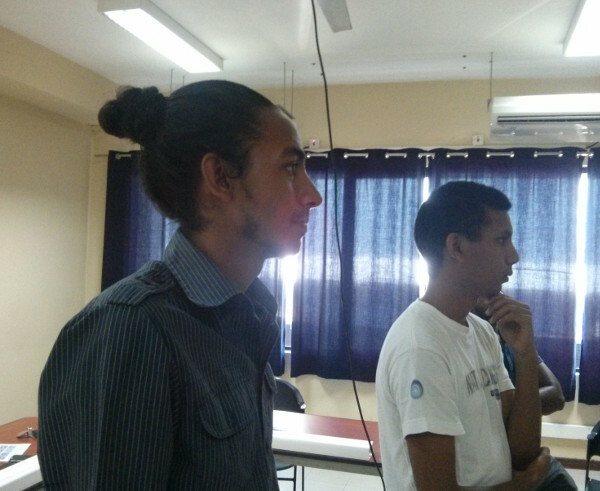 Participants were asked to brainstorm on the key things which they thought are relevant to Mauritius. 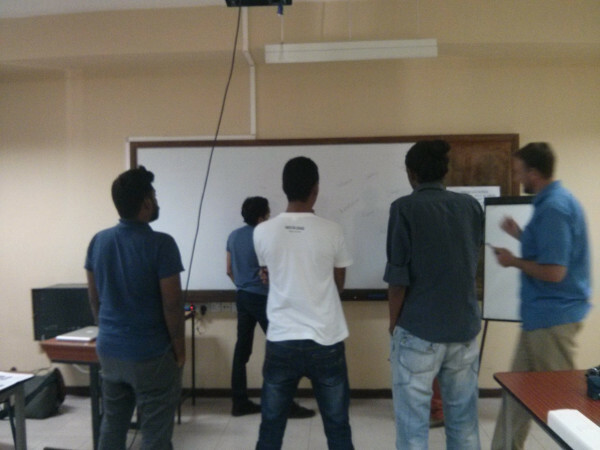 As you can see from the picture, the whiteboard was quickly covered with words which expressed the perceptions, feelings, worries and aspirations of the five young Mauritians. They then had to draw connections between ideas which they thought were related and explain why. This led to the inevitable explanations about the Mauritian setup: our ethno-religious groups (what we call ‘communities’), our struggle to define a national identity as well as other more universal social issues such as inequality, corruption, power struggles, drugs, politics, etc. Tim advised the aspiring film makers to use their insights about the society they live to find story ideas. 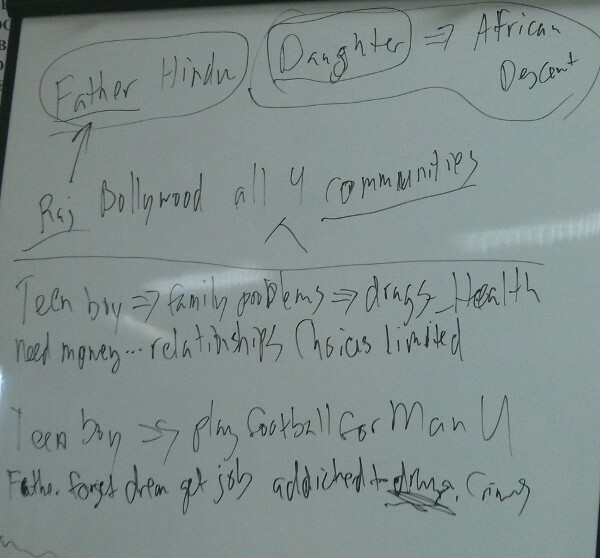 Based on the idea board, he quickly came up with two stories as you can see on the board. In the afternoon, Tim used a long scene from The Graduate to talk about dramatic structure in a screenplay. Typically, the screenplay should show that characters have goals they want to attain, use particular strategies to attain these goals and, if they cannot, will change their strategies in case they are unsuccessful (indicated by beats, i.e. new information, dramatic action or element). We finished by working on a commercial Tim is currently making for a big brand name in the US. We analysed the script and had to propose a list of shots and edits using a storyboard to help visualise what the shooting and final edit should look like. It was a quite intensive day but well worth it!